International news wire Agence France-Presse (AFP) has launched a YouTube channel which will be dedicated to covering next year’s French presidential elections, the Editorsweblog reports. The new channel has been launched in conjunction with Twitter and the CFJ journalism school (Centre de Formation des Journalistes), the report adds. 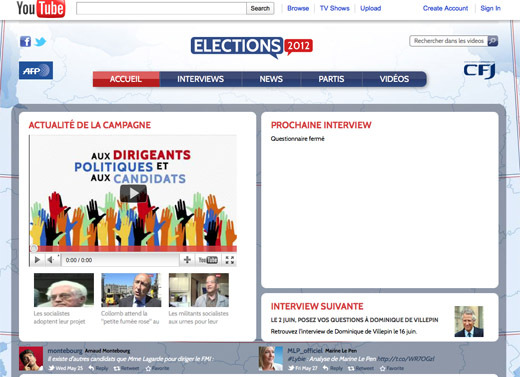 The channel hosts videos posted by political parties and tracks candidate popularity, but its main feature is an interface in which viewers can submit questions to candidates. The questions are then posed in interviews held by journalism students from CFJ. This entry was posted in Broadcasting, Editors' pick, Politics and tagged Agence France-Presse, editorsweblog, Video, YouTube on June 1, 2011 by Rachel Bartlett.